Category: All Posts | TMD Technologies U.S.
TMD Technologies, LLC (TMD-US), supplier of professional world class microwave and RF products, will again be exhibiting at the prestigious, traditional gathering of the EW community at the AOC Symposium in Washington DC at the end of November. On Booth 423, TMD-US will be showing a representative selection of its advanced EW/ECM products for airborne, ground based and naval platforms. 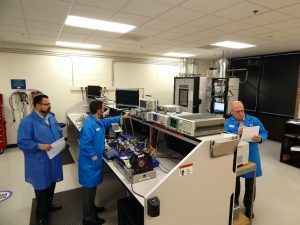 TMD Technologies, LLC (TMD-US) supplier of professional, world class, microwave and RF products based in Baltimore, Maryland has reported a record year of growth and expansion – winning several new microwave-based military programs and large and important orders from established TMD customers. Also, following the recent appointment of Tom Curtin as Vice President, Sales & Business Development, the TMD-US team has again been further strengthened with new key positions to boost its growing customer base and associated technical support operation. What is a Linear Accelerator and why are Instrumentation Amplifiers used? There are two main types of particle accelerator: Linear accelerators (LINAC) are a type of particle accelerator that sends charged subatomic particles at high speed to its intended target along a linear beamline. Linear accelerators have many applications but they are most commonly used within medical facilities. They are used for external beam radiation treatments for cancer patients, delivering high-energy x-rays or electrons to the location of a diagnosed tumor. There are also a number of existing and proposed scientific linear accelerators such as, SNS at Oak Ridge National Laboratory, ISIS at The Rutherford Appleton Laboratory and ESS in Lund which is under construction, where the accelerated particles are used to generate neutrons for microscopy. Circular accelerators can be used for medical applications including cancer treatment and the manufacture of radioisotopes for both treatment and diagnosis purposes. They are used for collider applications in high energy physics research facilities include the Large Hadron Collider (LHC) at CERN and the Relativistic Heavy Ion Collider (RHIC) at Brookhaven Nation Lab. Our Instrumentation Amplifiers are helping scientists and research facilities to investigate the mysteries of the universe. What is EMC Testing and what type of Instrumentation Amplifiers are used? What is EMC and why does it require testing? Electromagnetic compatibility (EMC) is the part of electrical engineering that deals with the unintentional generation of electromagnetic energy. This type of energy can cause a range of undesired effects such as electromagnetic interference (EMI) and even physical damage to certain types of equipment. When comparing the solid state Microwave Power Modules (MPMs) with tube based solutions in the same frequency range, they have the advantages of an instant on time; lower output noise; fast mute time; and will continue to function with inadvertent output mismatches (VSWR) while providing high reliability and a long service life. The recently developed PTXM range of TWT based Microwave Power Modules delivers exceptionally low weight and small size – typically 1.7 kg and 190 x 120 x 30mm, which has been achieved with no reduction in RF power or reliability. This high power-to-volume feature is the result of superior packaging techniques to efficiently use all available space. These MPMs are particularly suitable for airborne applications or for other situations where space and weight are critical. What is a Microwave Power Module (MPM)? A Microwave Power Module (MPM) is essentially a compact, integrated microwave amplifier – for amplifying radio frequency signals to high power levels. MPMs combine solid state and vacuum tube technology (i.e. a solid state driver and Travelling Wave Tube (TWT) output) with a built in power supply. At the EMC + SIPI Symposium 2018, TMD USA, supplier of professional world class, microwave and RF products based in Baltimore, Maryland, will be demonstrating its proven capability in the field of EMC/EMI. Emphasising this expertise is our recently introduced PTCM Series of intelligent, modular TWT (Travelling Wave Tube) RF instrumentation amplifiers. Operating over a frequency range from DC to 40 GHz, with a power output up to 50 kW, they are designed to deliver the highest field strengths in the test environment. Stay up to date with all the latest from TMD. 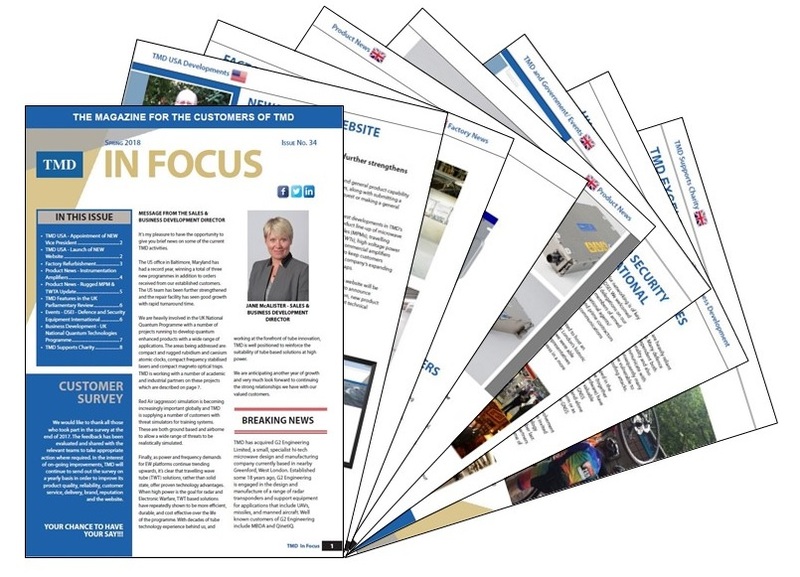 Download our Spring 2018 issue of In Focus – The Magazine for the Customers of TMD.